Το πρωτάθλημα της Formula 1 για το 2011 ξεκινά το ΣΚ που μας έρχεσαι στην Αυστραλία και όπως είναι φυσικό η Mercedes ανακοίνωσε το αυτοκίνητο ασφαλείας αλλά και το ιατρικό αυτοκίνητο. 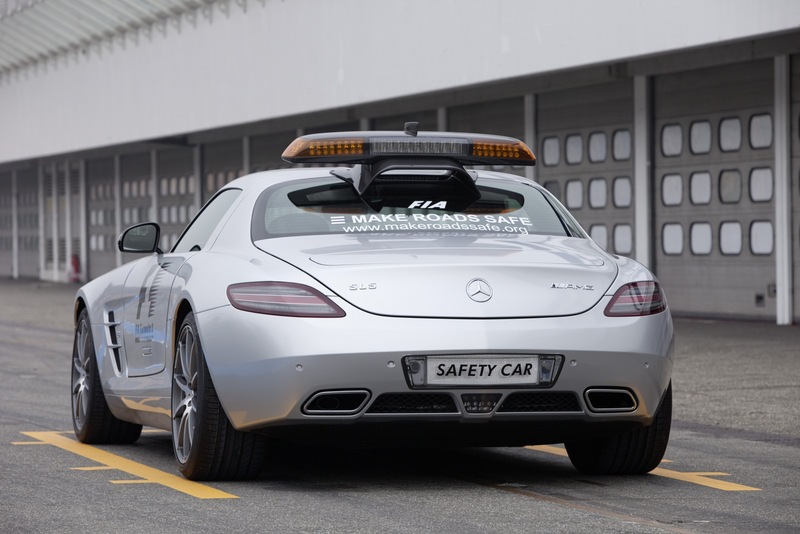 Το safety car παρέμεινε το ίδιο με το περσινό, η SLS AMG F1 Safety Car αλλά το medical car άλλαξε αφού το μοντέλο αναβαθμίστηκε. Βασισμένη πάνω στην ανανεωμένη C63 AMG Estate με το βελτιωτικό πακέτο Performance Package, o ατμοσφαιρικός V8 6.2 λίτρων αποδίδει 487 άλογα, με τα 0-100 χλμ/ώρα να τα κάνει σε 4.5 δευτερόλεπτα. Εκτός από το Performance Package, οι μηχανικοί της Mercedes τοποθέτησαν στον κινητήρα τα σφυρήλατα πιστόνια, τις μπιέλες και τον στρόφαλο της SLS. Ως αποτέλεσμα ήταν, ο κινητήρας να έχει 3 κιλά λιγότερα αδράνεια περιστροφής και έτσι να στροφάρει γρηγορότερα. Φορά το νέο αυτόματο κιβώτιο 7 σχέσεων AMG Speedshift MCT, τα φρένα έχουνε αναβαθμιστεί και πατά πάνω σε ελαφριές ζάντες διαστάσεων 19″ με ελαστικά 255/35 μπροστά και 295/30 πίσω. Σε σχέση με το μοντέλο παραγωγής, η C63 AMG Estate F1 Medical Car διαθέτει αγωνιστικά bucket καθίσματα, τα απαραίτητα αυτοκόλλητα, φώτα στην οροφή, LED φωτιστικά σώματα ενώ την θέση της πίσω πινακίδας έχει πάρει μια LED πινακίδα που εμφανίζει την λέξη “Medical Car”. Η C63 AMG είναι η τέταρτη χρονιά που έχει τον ρόλο του ιατρικού αυτοκινήτου στην F1 ενώ η πρώτη ήταν το 1996, όταν η C36 AMG είχε ταυτόχρονα τον ρόλο του Safety και Medical Car. Affalterbach – Ready for the starting event of the Formula 1 World Championship in Melbourne, Australia (25-27 March 2011), Mercedes-AMG is once again providing the Official F1™ Safety Car and the Official F1™ Medical Car. The task of the SLS AMG and the new C 63 AMG Estate is to ensure maximum safety in dangerous racing situations or following an accident. The SLS AMG has been used in Formula 1 since 2010. The C 63 AMG Estate is now entering its fourth season, but in 2011 it will appear in a new design with updated technology that includes the AMG SPEEDSHIFT MCT 7-speed transmission. AMG has been continuously active in Formula 1 for 15 years. 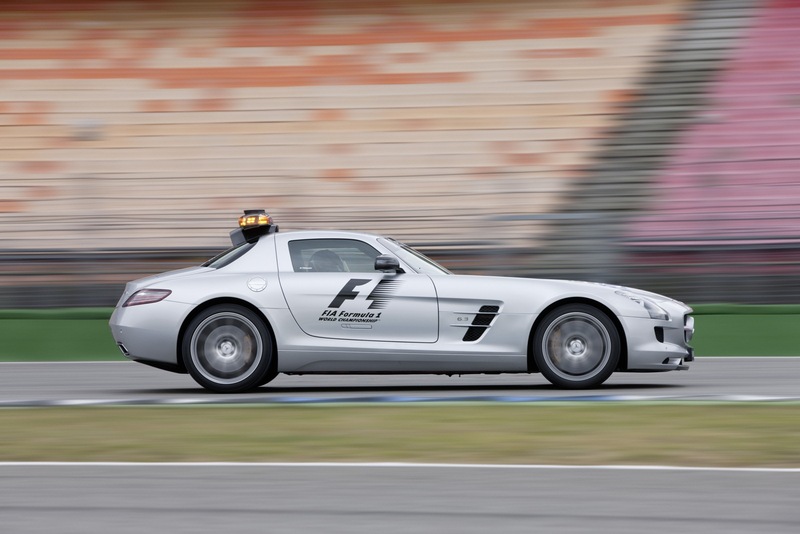 The SLS AMG Official F1™ Safety Car is sent onto the track by Race Control whenever an accident or poor weather conditions endanger the safe progress of the race. The gull-wing is driven by German racing driver Bernd Mayländer (39), who has performed this function for the FIA (Fédération Internationale de l’Automobile) since 2000. Mayländer is not only on station for Formula 1 weekends, but also for most of the accompanying series such as the GP2 Series or Porsche Supercup. 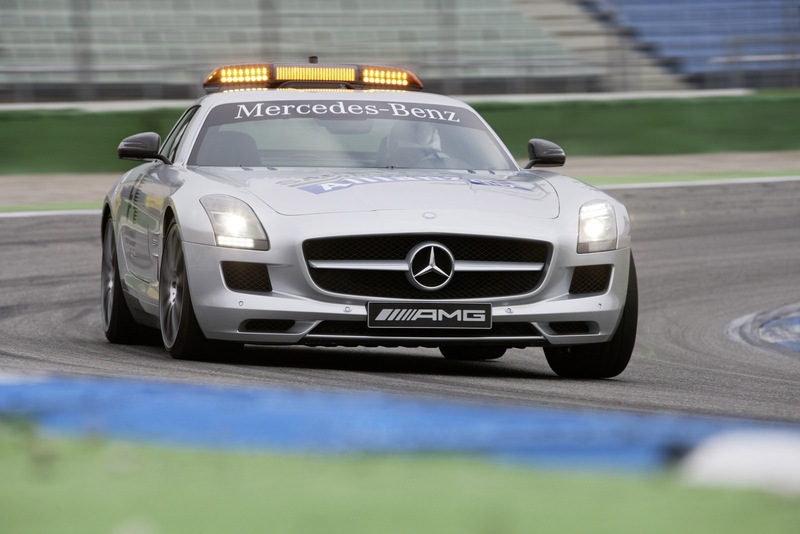 During a race the SLS AMG Official F1™ Safety Car is on standby in the pit lane. Its deployment is decided by Race Control. On receiving a radio message, Bernd Mayländer and his co-driver, FIA man Pete Tibbetts (45, from Great Britain), take to the track at the head of the field in order to guide the Formula 1 racing cars safely around the circuit. 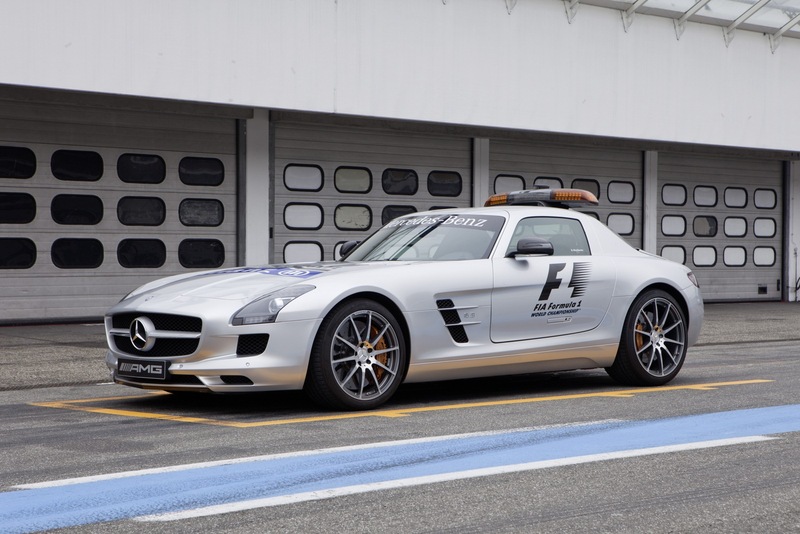 The Mercedes-Benz SLS AMG has the best possible credentials for this demanding role in the top flight of motor racing: the engine, power transmission, suspension and braking system of the Official F1™ Safety Car are the same as in the standard production SLS AMG. The exceptional technology package for the super sports car ensures perfect driving dynamics and means that no further technical modifications or lightweight design measures are necessary, with the sole exception of the all-new rear silencer, which allows the high-revving AMG V8 naturally aspirated engine to breathe more easily and offers Formula 1 fans an even more emotionally charged sound experience. The AMG 6.3-litre V8 engine has a peak output of 420 kW (571 hp) at 6800 rpm and a maximum torque of 650 Nm at 4750 rpm, enabling the gull-wing model to sprint from 0 to 100 km/h in 3.8 seconds. 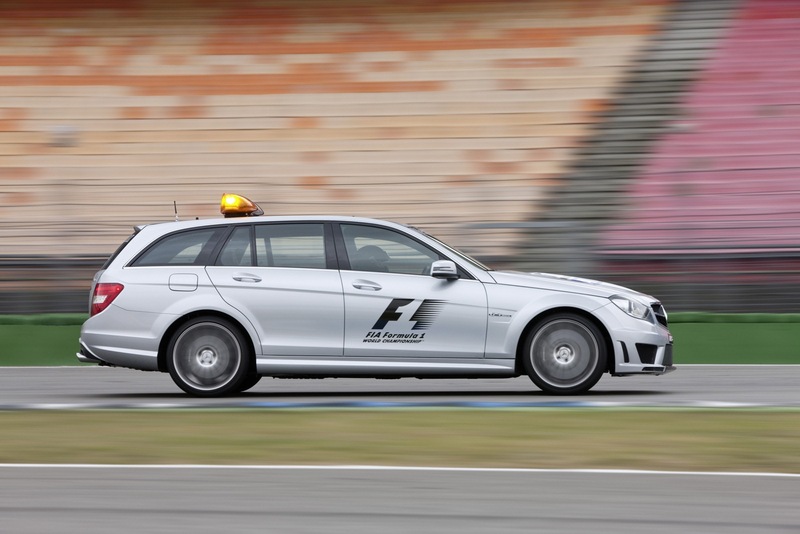 Fast lap times are a matter of course for the Official F1™ Safety Car, otherwise the Formula 1 cars’ tyres and brakes would cool down too quickly, while their engines could overheat. The unique vehicle concept is a key factor in ensuring outstanding driving dynamics: the aluminium spaceframe body keeps the vehicle weight down to 1620 kilograms (DIN kerb weight). And thanks to the dry-sump lubrication system, the AMG V8 powerplant can be installed very low down, resulting in a beneficial lowering of the vehicle’s centre of gravity. The installed position well behind the front axle, and the transaxle arrangement of the new seven-speed double-clutch transmission on the rear axle, have a positive effect on the weight distribution, which is 47/53 percent (front/rear). Pure motorsport technology is used for the AMG sports suspension: aluminium double-wishbone axles at front and rear ensure outstanding driving dynamics with precise turn-in ability, first-class agility, low mass inertia during fast changes in direction, and therefore high cornering limits. The AMG SPEEDSHIFT MCT 7-speed sports transmission with dual-clutch technology features four modes and allows fast gear changes with practically no interruption in tractive power – in manual mode (“M”), gear changes can be effected in 100 milliseconds. Together with the 3-stage ESP®, the integrated mechanical multi-disc differential lock ensures outstanding traction. Meanwhile, braking distances are minimised and resistance to fading is maximised, even when the brakes are subject to typical race-track loads, courtesy of the AMG ceramic high-performance composite braking system with its generously sized ceramic discs measuring 402 x 39 mm at the front and 360 x 32 mm at the rear. The weight-optimised 10-spoke forged wheels are shod with 265/35 R 19 (front) and 295/30 R 20 (rear) tyres. Compared to the standard-production SLS, the Official F1™ Safety Car is distinguishable on the outside by its prominent F1 logos, carbon-fibre exterior mirrors and the characteristic roof light bar with integrated TV camera. It sits on an all-new carbon-fibre hood whose shape has been tested in the wind tunnel to ensure optimum airflow at the rear aerofoil. The aerofoil pops up when the car reaches 120 km/h, and together with the rear diffuser it provides the necessary rear downforce. LEDs are used for all light functions in the aerodynamically styled roof light bar. Their advantages over the previously used bulbs lie in their extremely fast response time and low power consumption. 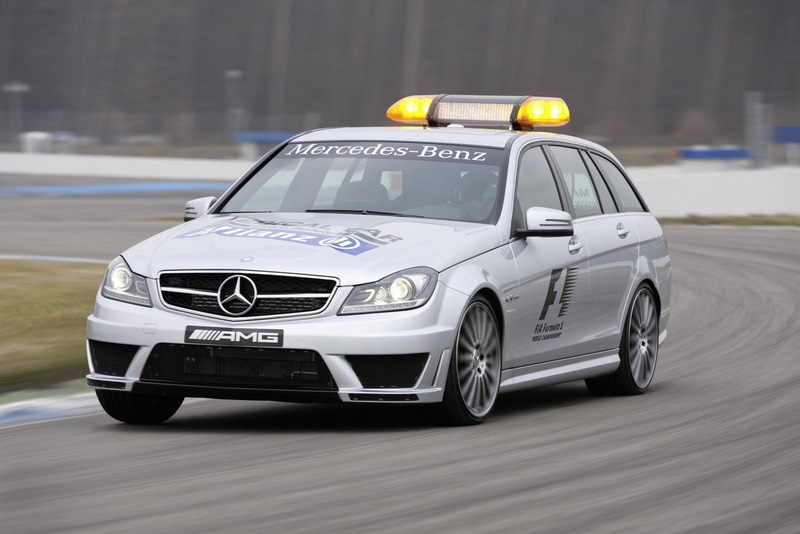 The two centrally positioned green lights in the light bar are lit up when the Official F1™ Safety Car joins the field, and must first be overtaken by all the Formula 1 racing cars taking part. Once the SLS AMG has assumed the leading position, the outer orange flashing lights are switched on to signal to the Formula 1 drivers that no overtaking whatsoever is allowed. 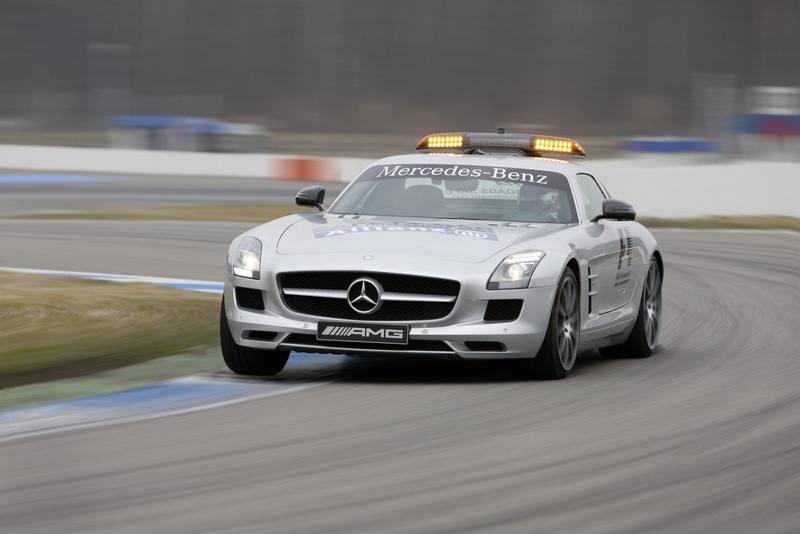 The white stroboscopic lights in the headlamps and tail lights have a general signalling function, and are always flashing while the Safety Car is deployed. 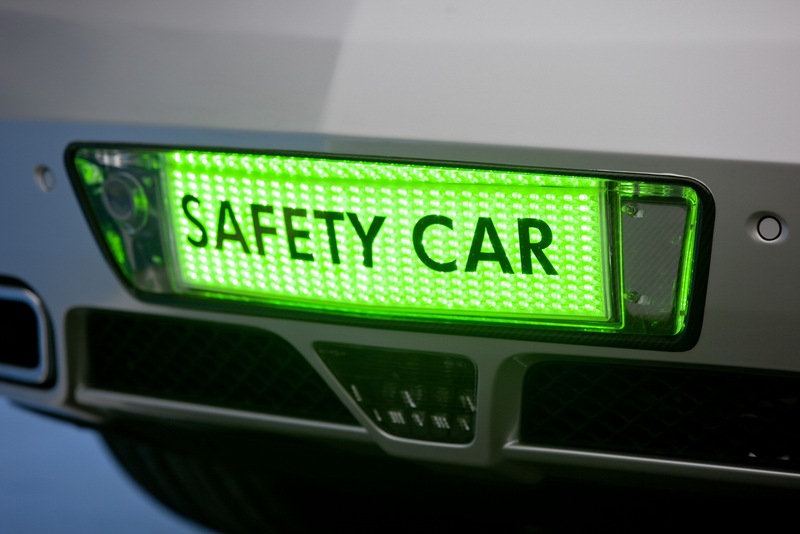 A special number plate at the rear, with “Safety Car” lettering and 700 LEDs, provides additional safety in darkness or wet weather. A rear camera is integrated to the left of the number plate, allowing those in the cockpit of the Official F1™ Safety Car to keep an eye on the Formula 1 cars behind via a monitor. Opening the striking gull-wing doors reveals a functional cockpit which – like the exterior – is only slightly different from the standard model. AMG sports bucket seats with black leather upholstery and six-point seat belts ensure optimal lateral support. To the right of the AMG DRIVE UNIT there are four coloured keys operating the various lighting functions and the signal horn, which is activated for safety reasons when entering andleaving the pit lane. The centre console is of carbon-fibre, as are other areas of interior trim. The AMG Performance steering wheel in leather/Alcantara has a specially contoured grip area, a high-grade metal insert and a 370 millimetre rim with a flattened lower section. The seven gears of the dual-clutch transmission are shifted using the two metal shift paddles. Two central monitors in the SLS AMG cockpit are used to monitor the progress of the race. To the left and right of the lower monitor are the controls for the radio system, which allows Bernd Mayländer and Pete Tibbetts to communicate with Race Control as well as with each other. A second interior mirror lets the co-driver keep an eye on the Formula 1 cars behind. Meanwhile, the “Marshalling System” is integrated in the central display on the instrument cluster and in the lid of the glove compartment: here the driver and co-driver can see exactly the same signals as the Formula 1 drivers in their cockpits. For instance, the various LEDs indicate when yellow or green flags are being waved. LEDs indicating the status of the roof light bar, along with an on-board camera angled towards Bernd Mayländer, are mounted at the front end of the dashboard. As in 2008 to 2010, the C 63 AMG Estate is the Official F1™ Medical Car responsible for ensuring a rapid emergency response in the event of an accident. The super-fast estate car follows the Formula 1 field during the starting lap, because the race cars are still bunched extremely closely during this critical phase of the race. The current version of the C 63 AMG Estate will be used for the new season, with state-of-the-art design and engineering. Major new visual features include the aluminium bonnet with modified powerdomes, the radiator grille, the headlamps and the AMG rear apron. To ensure the best possible airflow to the radiator/coolers, the AMG front apron has larger intake apertures and side air vents. From now on, power is transmitted by the innovative AMG SPEEDSHIFT MCT 7-speed sports transmission with a wet start-up clutch, four driving modes, a double-declutch and a RACE START function. Dynamic performance is guaranteed by the AMG 6.3-litre V8 engine, which now delivers 358 kW (487 hp) at 6800 rpm in the Official F1™ Medical Car. The increase in output versus the standard 336 kW (457 hp) engine is due to the AMG Performance Package, which is optionally available for any C 63 AMG and makes an acceleration of 4.4 seconds from zero to 100 km/h (Estate 4.5 sec.) possible. For the AMG Performance Package the engine specialists have placed their trust in a technology transfer from the SLS AMG: the forged pistons, connecting rods and lightweight crankshaft have been adopted from the gull-wing model. The lower inertia of the three-kilogram lighter components allows the naturally aspirated eight-cylinder engine to rev freely and respond even more promptly. Distinguishing features of the Performance Package include the variable intake manifold painted in titanium grey and the AMG high-performance braking system with internally ventilated composite brake discs at the front axle. Outstanding driving dynamics are also ensured by the adjustable coil-over suspension, the AMG light-alloy wheels shod with size 235/35 R 19 (front) and 255/30 R 19 (rear) tyres, the differential lock and 3-stage ESP®. Maximum durability is provided by the optimised coolant, engine oil, transmission fluid and power steering fluid cooling. Invisibly but unmistakably, the characteristic AMG V8 sound issues from the special rear silencers of the AMG sports exhaust system. 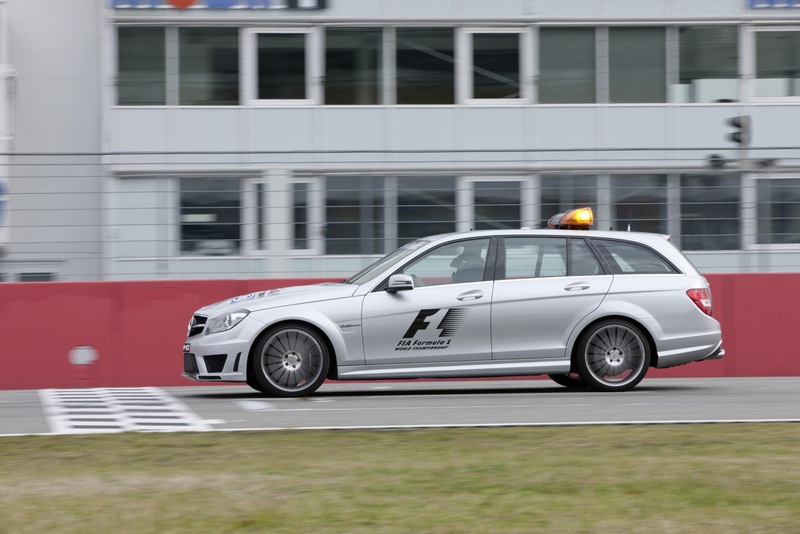 Like the Official F1™ Safety Car, the Official F1™ Medical Car is distinguishable by its F1‑ logos, the roof light bar, and the stroboscopic flashing LED lights at the front and rear. A number plate illuminated with LEDs and displaying the words “Medical Car” on the tailgate makes the car easier to see in darkness or adverse weather conditions. The Official F1™ Medical Car is piloted by racing driver Alan van de Merwe (31, from South Africa); his co-driver is the official FIA Grand Prix Chief Medical Officer Dr Gary Hartstein (56, from Belgium). Two assisting medical experts from a specially-selected clinic near the race track sit in the rear. Four AMG sports bucket seats with six-point seat belts, two monitors integrated into the centre console for monitoring the race and a radio set for communicating with Race Control distinguish the interior of the Official F1™ Medical Car from that of the standard-production C 63 AMG Estate. There is plenty of space for all the emergency equipment – including a defibrillator and respiration apparatus – in the 485-litre luggage area of the C 63 AMG Estate. 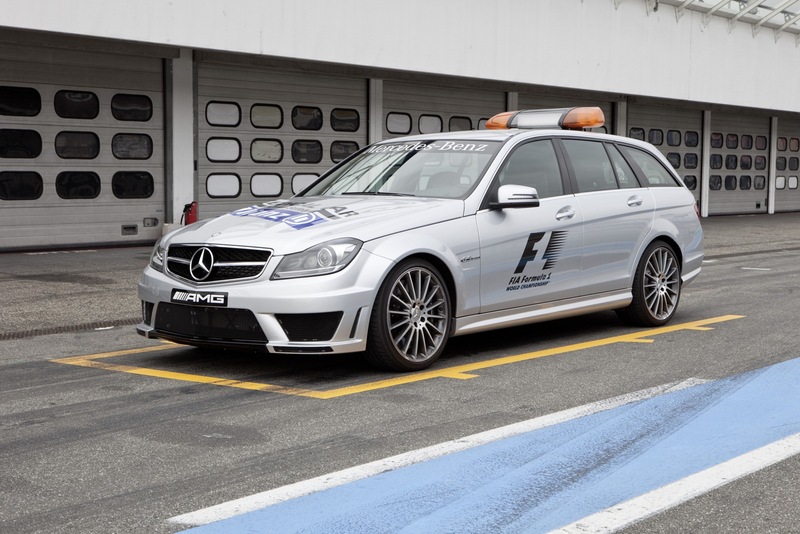 The development, track-testing and configuration of the two Official F1™ Safety Cars and the two Official F1™ Medical Cars – in both cases, there is one emergency vehicle and one replacement vehicle – are carried out by the specialists from the AMG Performance Studio in close collaboration with the test team for AMG overall vehicle development. This involves drawing on over 40 years of know-how from the field of motorsport, as well as the wealth of experience in the design of high-performance sports cars. Numerous test drives were carried out on various racetracks in order to tune the suspension and verify all the systems and components. 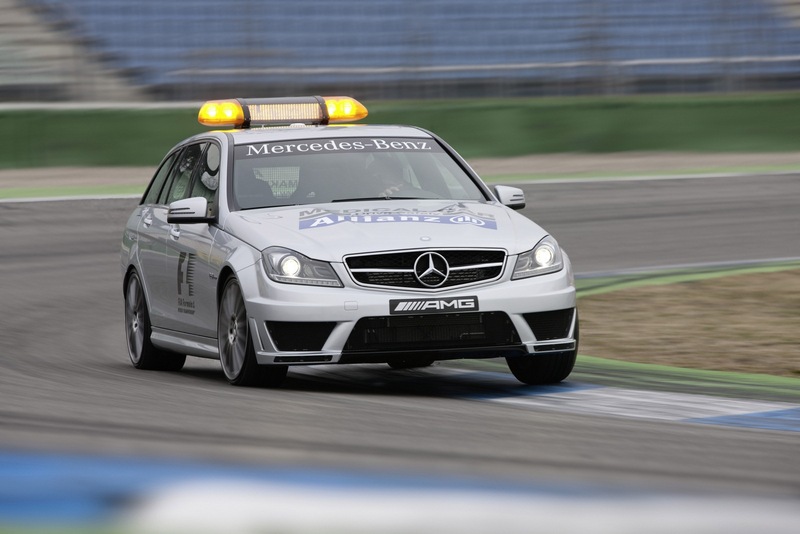 Two highly-qualified AMG technicians are also on hand to take responsibility for the deployment of the Safety Car and Medical Car at all Formula 1 races in the current season. 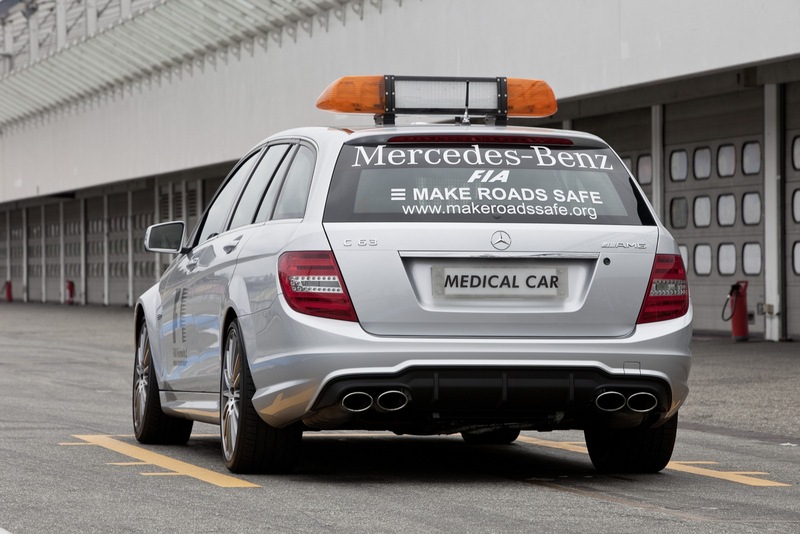 AMG has extensive experience in the design, development and deployment of the Official F1™ Safety Car and Official F1™ Medical Car. The Affalterbach-based company has been active in the top echelon of international motorsport since 1996. As early as 1984, an AMG E-Class Coupé with a V8 engine was used occasionally as the Medical Car. The activities of AMG are also evidence of Mercedes-Benz’s longstanding commitment to Formula 1.